The car everyone would love to own! Thunderbird’s compact size is unique. It looks hardly bigger than a racing car, yet under the distinctive visored Thunderbird roof are four luxuriously deep, individually contoured seats, with elegant room for everyone. Thunderbird’s doors are exceptionally wide (4 feet, to be exact), and the front passenger seat folds all the way down. This gives you direct, easy access to the rear seats. Thunderbird’s trunk is 5 feet, 5 incles wide – room enough for four big suitcases, golf bags, plenty of other gear. Thunderbird’s exclusive console brings power window controls and ash trays within convenient reach of all passengers. Thunderbird’s performance is provided by the standard 300 hp Special V-8. Also availale is the optional 350 hp Special V-8 – largest and finest in the industry, which makes the Thunderbird a peer of even the sports car field. Thunderbird driving, handling and parking ease is, of course, unsurpasseed. The Thunderbord is so compact t can run rings around other luxury cars. 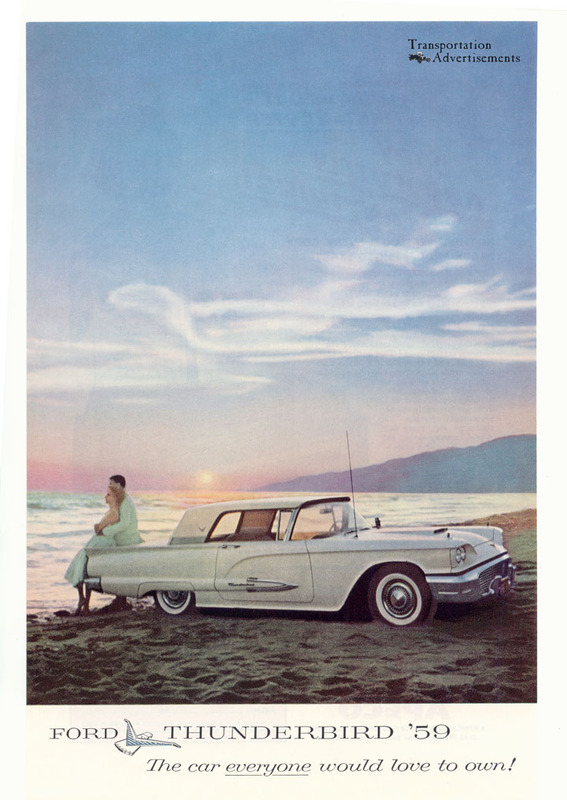 Your Ford dealer invites you to drive the 1959 Thunderbird. When you do, you’ll find it harder than ever to believe that this car, with all its unique advantages, costs far less than other luxury cars! 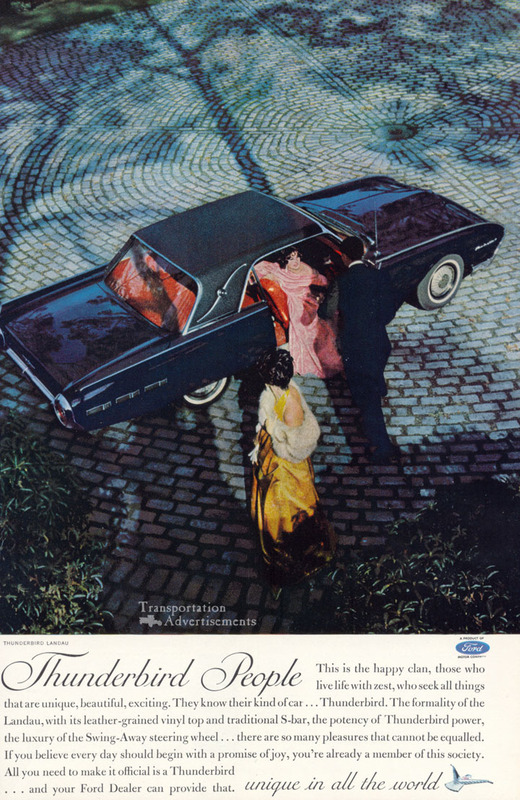 This ad featuring the 1962 Thunderbird Landau, promotes the “uniqueness” of both the t-bird and the people who own/drive them. Transportation Advertisements is powered by	WordPress 5.0.4 and delivered to you in 0.453 seconds using 32 queries.